It happens quite frequently that in our database applications – in queries or in PL/SQL packages – we need to use the values from more or less standard domains or custom lists of values. For example the list of all months in the year – to show a breakdown list of some measure per month. Or the days of the week, to do something similar. Sometimes we just need a list of numbers in a certain range. And it is quite common to outer join such a collection of domain values with the set of measurements, using the partition outer join feature – to ensure that for each category of measurements, there is an aggregate for each of the values in the domain. This article demonstrates several examples of standard domains, some SQL tricks for composing domains out of thin air and a number of features to spell out numbers and internationalize days and month names. Occasionally, we might want to use a query that returns the alphabet – a single row for every letter in the (ASCII, Western European) alphabet. For example to count the number of employees listed under each letter. This query really is a special case of the more general ‘all numbers in a certain range’ that we will see next. Note how the subquery (alphabet) is set up, apart from the main query in which the alphabet is used. You will see the WITH clause a lot in this article, to separate the initialization of the domain from the main query that uses the domain. It makes queries much better readable and much easier to maintain. Of course you knew that CHR(65) equals ‘A’. A set of numeric values, typically integers, in a certain range – from a start value to an end value – is another common requirement. 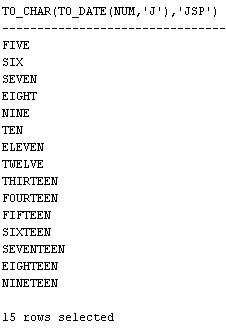 In fact, even the alphabet is based on the range 1..26 that is then turned to letters using the CHR function. A practical query for the common ‘numbers in range ‘ use case is constructed like this, using the WITH subquery factoring approach. Of course, days of the week is first of all a set of seven numerical values in the range 1..7. However, using to_char (and to_date) we can pry the labels of these seven days from the database as well. 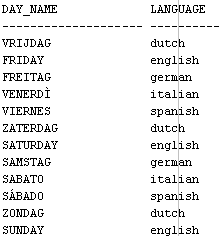 And, as we will see in the next section of this article, we can retrieve the names of the days in many different languages. The essence here is the use of the string_table to provide a compact way to defining the domain values and the table operator to turn the collection of domain values into individual rows again. The database can return numbers as numbers – 1, 5 and 3242 – but we can also create a query that spells out those numbers (in English only) – one, five and three thousand two hunderd forty two. The next query demonstrates this, using the to_char( to_date( num,’J’ ), ‘JSP’) combination. Our Oracle RDBMS speaks its languages. 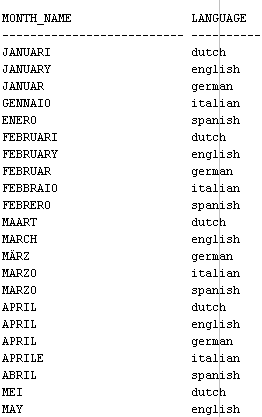 Well, at least for a limited number of strings – more specifically: the names of week days and of the months – the database can provide translations into a substantial number of languages. The to_char() function takes a third, optional parameter nls_data_language that can be set to retrieve day and month names in the language of choice. The next query demonstrates this.